Private Swim Lessons are available at Marbella Country Club starting June 3rd. Lessons run in 20 min increments, and are available from 12:00pm- 3:00pm. Our swim instructors use an exciting, customized approach to cultivate a love and respect of the water in swimmers of all ages and levels. Private Lessons are tailored to meet the needs of each individual swimmer. Lessons are purchased individually. Once your first lesson is purchased you can sign up for additional lessons by calling the office, using the parent portal, or directly with your instructor after your lessons. Premier Aquatics is proud to be back at Marbella Country Club for summer swim team. The Marbella Manta Rays continue to be a strong and exciting program with over 50 swimmers competing in our 10 week summer season. We know that 2019 will be our best and most exciting season yet. Premier swim team participants will learn all there is to know about the sport of swimming, including the four competitive strokes (freestyle, backstroke, butterfly, and breaststroke), starts and turns for all strokes, use of timing clock, and lane etiquette. Fee: $380 per swimmer. Fee includes meet fees, banquet fees for swimmers, pictures, trophies, one swimsuit, and all other season costs aside from additional apparel. Apparel: The team swimsuit is included in the swim team fee, however additional apparel (t-shirts, sweatshirts, etc.) is not included in the summer registration fee. To order team apparel please click the button below. Swimmers do not have to order new apparel each year, however, swimmers must be in team apparel to compete in meets. To register or swim team, please click the Register Now button below. *Please note, swim lessons and swim team are only available to members and sponsored guests of Marbella Country Club. 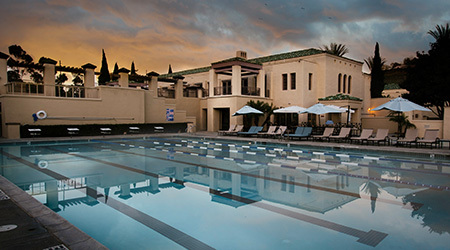 The Aquatic Center at Marbella Country Club is located in beautiful San Juan Capistrano. Members of the Country Club can enjoy the different incentives that Premier Aquatics has to offer Orange County. Premier Aquatics offers private swim lessons for all ages at competitive pricing, compared to surrounding facilities. The swim lessons offered at the aquatic center are designed to teach swimming in the safest and most enjoyable way possible. Participants will be paired with an instructor who is eager to teach and loves what they do! Swim lessons will begin in May and will continue through the duration of the summer. Throughout the entire learning process, swimmers will be having a great time! On the weekends, Marbella Country Club Aquatic Center is guarded by our awesome Premier Lifeguards. These lifeguards are all qualified and trained to overcome any situation. Their primary goal is to keep pool-goers safe and comfortable. They act as superheroes around the water. Members of the Marbella Country Club are able to book birthday parties at the aquatic center as well. Splashing around in the pool and soaking up the sunshine is a fun and enjoyable way to spend any birthday! Country Club members are able to have private lifeguards at their birthday parties, to ensure that all individuals attending the party are able to have fun in a safe way. Premier Aquatics also runs a seasonal, summertime competitive swim team at the Marbella Country Club Aquatic Center. Swim team members practice four times a week and engage in both drills and various forms of lap swimming that improves their technique and keeps them conditioned in all swim strokes. Swimmers compete with other various clubs in the area and participate in a big championship swim team at the end of the summer. Whether you are interested in having a fun day by the pool, learning to swim through one of our swim lessons programs, or staying conditioned and competitive on swim team, the Marbella Country Club Aquatic Center is the place to be! If being a lifeguard, swim instructor, or swim coach at the Marbella Country Club is something that interests you, please visit our website at www.swimoc.com/careers for more information on available jobs and how to apply.